I am so happy to be a WhiteTreeFabric blogger as they send me the best fabric I have ever sewn with. It has made me realise that the best results are from beautiful fabric. 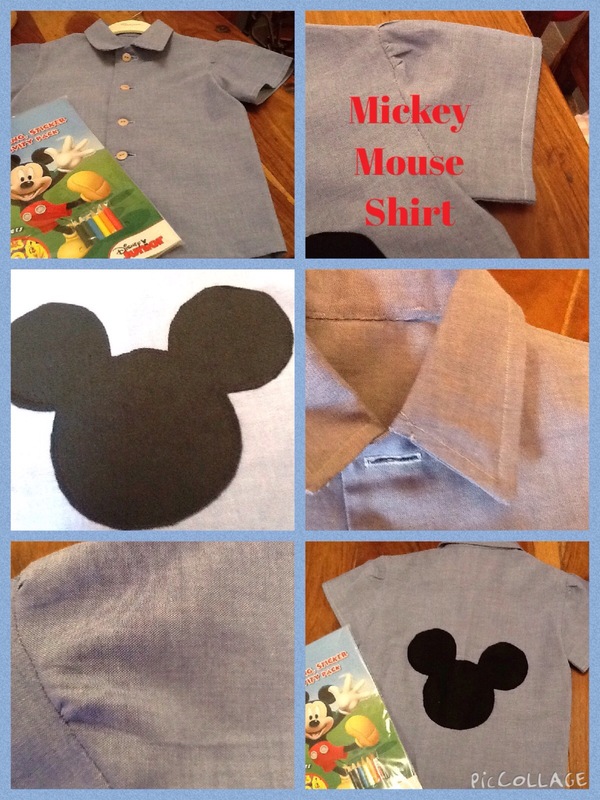 So I decided to make a little gift for Lisa who does all the organising and has a little boy who loves Mickey Mouse! Lisa is always so complimentary about my sewing that she makes me want to sew more! I used Simplicity 1413 and did my best sewing as it was for someone else! I have to admit that I had already made him a jacket with a pattern I already had but it was tooooooo girly! And knew I could not send it! So what started out as a lovely kind thought seemed to keep going wrong! Anyway, I sewed the shirt carefully and neatly and decided to put some metal poppers on it to fit with the denim theme! I bought the poppers and could not get them on the shirt. I was hammering and hammering like the instructions said and it just did not work! 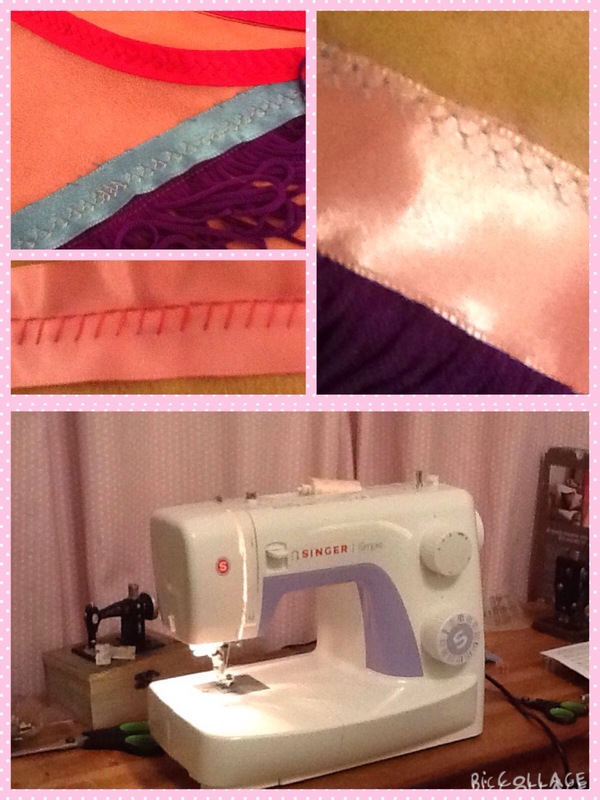 So I decided it had to be buttonholes…..on the day my 35 year old machine finally gave up! The new one I bought needed to do buttonholes and auto threading and decorative stitches! I practised and practised with the buttonholes and became quite the expert! Enough to sew on the shirt………they all went so well until I sewed the buttons on and looked at the shirt! Oh my! Disaster! I had gone mad with buttonholes……and the last one was not spaced correctly. I was so upset! I couldn’t think how to remedy the shirt and put it in the cupboard. I decided Lisa was just not meant to get a new shirt for Sam! I emailed to tell her I had tried to make it but it was a disaster and she was soooooo delighted I had gone to the trouble she wanted it anyway. 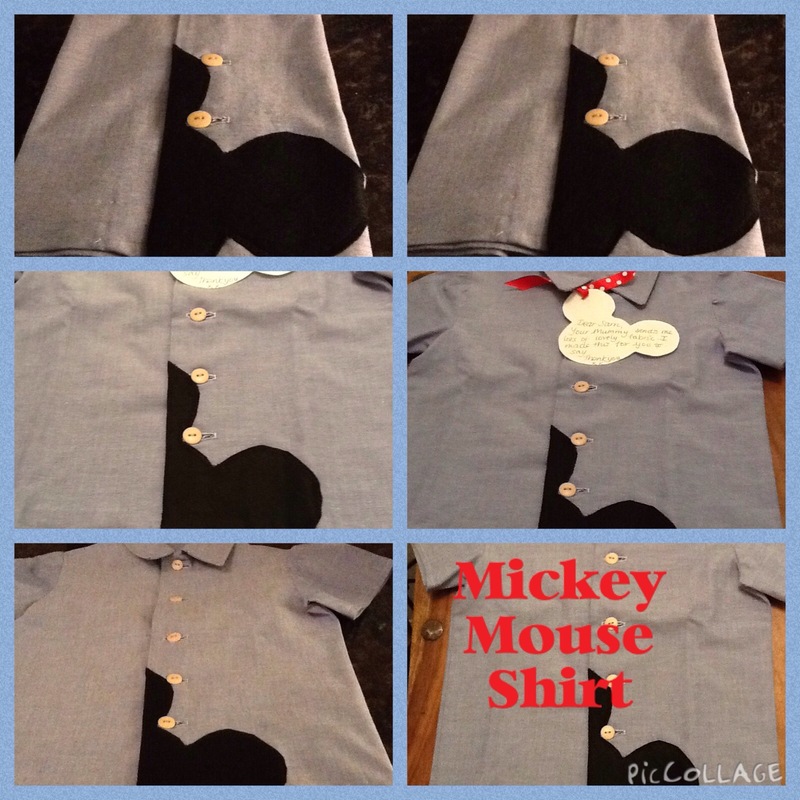 I put my thinking head on and finally came up with an avant garde idea….a wonky Mickey Mouse in the front! A perfect gift from a wonky stitcher! Do you know what?? I am really pleased with it! I think Sam will like it too….and if not , I am sure the sticker book will make up for it! 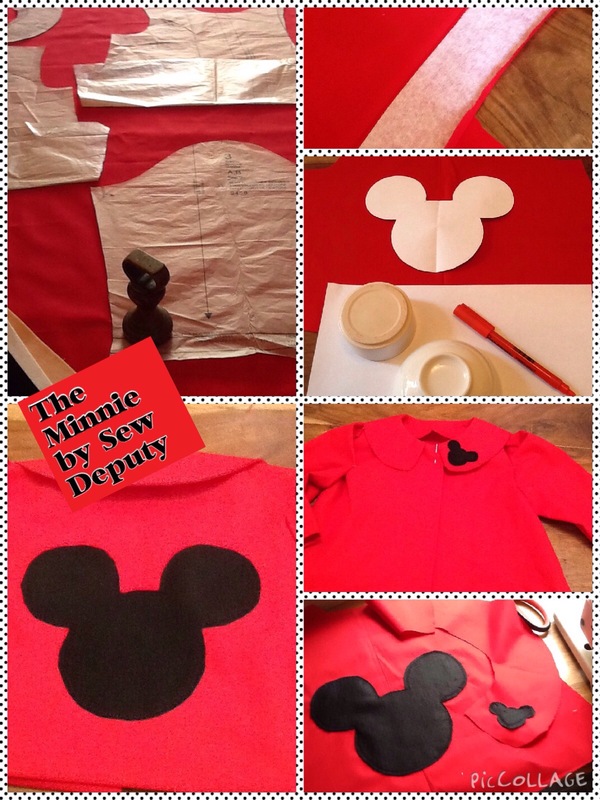 So the lesson is…..sometimes you just need some thinking time and there may be an answer to some wonky sewing! 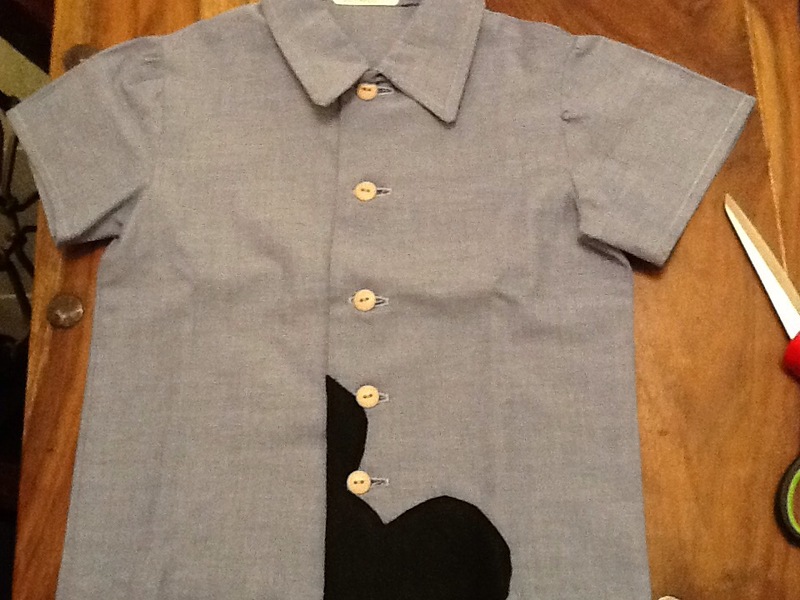 Notions : 1 metre denim chambray , 5 buttons, interfacing for collar, black felt. Wonkiness: 3/10 I have been making this for so long it can’t score highly. But I suppose I did make a jacket for my niece in the process! I am now good at buttonholes but need to practise my measuring and spacing! You did an awesome job! Having Mickey peeking out from the center front makes the shirt so, so special (and really cool, too). Thanks! I love it too! Even more now! I think your shirt is so cool. A very clever idea! I’ve lived with a few sewing mistakes. It happens! But you remedied it perfectly! Thank you so much Amanda for thinking of Sam. He is utterly obsessed with his sticker book, but more than that – he’s excited to get to Florida next week so that he can wear his handmade, bespoke, gorgeous, lovely, one-off Mickey shirt. What a fan-TAS-tic save for this shirt!